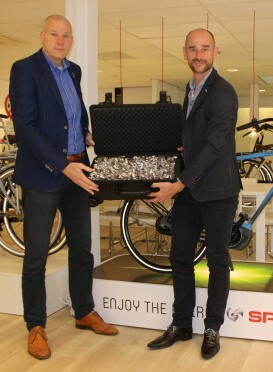 Last week, the high-tech connected modules made by Axa bike security were delivered to Sparta in Apeldoorn. The first 250 of these connected e-bikes have now been produced via a specially designed production process. In the future, Sparta expects to make many more connected e-bikes and the app will also get new functionalities that will further increase convenience. IoT makes use of the possibility to connect devices to the internet. This creates new benefits for the user. It means you can park the bicycle ‘virtually’. As soon as someone sits on your bike or moves it unexpectedly, you get a notification on your smartphone. If your bike has disappeared or you do not remember where you have parked it, you can always find it again with a handy track & trace card.